Ready to escape the traffic, smog and noise of the city? Nanny's Shanty is the ticket! 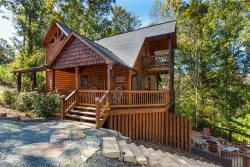 This charming 2 bedroom, 2 bath cabin sits right on the well known Toccoa River. This area of North Georgia is a great place for fishing, hiking, biking, all kinds of water sports, horseback riding, zip lining, unique shopping and fabulous restaurants etc. The Master bedroom, located on the main level has a queen size bed and a full bath. The second queen bedroom is located in the loft and also has a full bath. Downstairs you will find 2 twin beds, a pool table, game table, washer and dryer and access to a patio with a large hot tub. You can walk right out to the spacious back yard where a fire pit (firewood not provided but available year round), gazebo, large deck with tables for dining as well as 2 fishing landings that literally hang over the river. If cooling off in the beautiful mountain waters is what you're looking for, no problem, stairs leading to the water make access a breeze. The living area, located on the main level has a gas log fireplace, perfect for chilly nights in the mountains, cable TV and DVD player. The well equipped kitchen provides everything needed to prepare some great meals. Why does food always taste better in the mountains? There is a gas grill as well as a charcoal grill (Charcoal not included). There is a screened in porch on the main level with a couple of rockers and a swing where relaxing with a bird's eye view of the river is always enjoyed. Pack your bags, grab the fishing rods and head on up to possibly one of the best mountain getaways you've every experienced! Small dogs (15# and under) are considered. We thoroughly enjoyed our stay and Nanny's Shanty. The property was clean and well maintained. The property was easy to find once we had the driving directions from Mountain Oasis. It was just the quiet getaway we needed to relax and recharge. We are looking forward to staying there again soon. It was a gift from my mom for my birthday. It was very peaceful and I really enjoyed myself. It was in the winter so cold and rainy but liked it a lot. Had trouble with the fire place didn't have instruction on how to light it after I turned it the wrong way. But they sent someone out to help me. Everyone was great. It was great. My wife and I hade a fantastic time. Great cabin and location.Everything was just as it said it would be. Very clean and ready to go! Felt like we were out in the middle of nowhere but were only minutes from Blue Ridge. The cabin was beautiful and really enjoyed being very close to the river. I didnt catch any trout which was disappointing. The amenities were awesome though and everything was there that we needed. Magical trip. Boys loved it!!! We really enjoyed our stay and are looking forward to our next trip. We loved the place need more tv channels for when ya cant get out and at night. Our cabin was exceptionally clean and in an excellent location. Mountain Oasis must me doing something right! The cabin was very nice and relaxing. It was nice just to get away and sit by the river. Also it was close to shops and mercer apples which we enjoyed. Just wished we could have stayed longer. Already have recommended to a friend. Start to finish was a pleasant experience. Great communications. Great place to stay, very peaceful! We loved Nanny Shanly. It was a quiet and relaxing place. We choice it for our honeymoon. We will stay again there. The Nanny Shanty cabin was just what we needed. Great location for fishing and kayaking the Toccoa River. The directions to the cabin couldn't have been made easier to follow. Also short drive to Blue Ridge. The booking with Mountain Oasis Cabin Rentals was very simple, the person I dealt with was very friendly. Thank you so much for sharing your cabin with us! The view was amazing and while the fish werent biting, we enjoyed watching the ducks and goose (Miss Eats-a-Lot) and the early morning fog. The cabin had everything we needed, including lots of pillows! Our family of 5 was very comfortable. While we went into Light Up Blue Ridge, our favorite time was spent playing catch outside. Thank you again! We had a great time at the cabin! We really enjoyed the fresh flowers and the inviting feel.